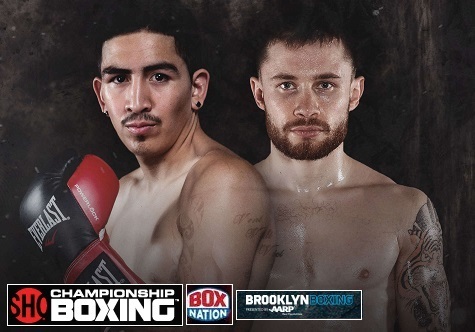 Showtime Championship boxing will present solid fight card on Saturday, 30th July 2016 when Irish boxer Carl Frampton defend his IBF Super-Bantamweight title against Leo Santa Cruz who will also put his WBA title on the line. Carl Frampton will be looking to become first Irish boxer to become world champion in two weight classes and that sets up a exciting boxing night for fans. The fight is scheduled to take place at the Barclay Center arena in Brooklyn, New York this Saturday, 30th July. Frampton vs Santa Cruz TV Coverage: US viewers can watch the fight live on Showtime (non-ppv) starting at around 9:00 p.m ET. While British and irish fans can tune in to BoxNation to watch the fight live on TV and online. BoxNation offer monthly subscription priced at £12 (no contract required). BoxNation coverage of this fight card will start at around 02:00 a.m uk time (early hours of Sunday morning). Mike Garcia vs Elio Rojas fight will be the co-feature event of the night while Paulie Malignaggi will take on Sergey Rabchenko. There are other quality fights including Amanda Serrano defending will be defending her WBO Featherweight title against Calixta Silgado. How to watch Frampton vs Santa Cruz Live Online ? Showtime will broadcast the fight live on their regular channels and through online streams available on their official website for US viewers only. While UK & Irish viewers can watch the fight live both on TV and through online/mobile streams via BoxNation. But if you still dont have access to live action or you reside in countries where this fight is not available you can always tune in here for live action and full fight replays.